It is the business end of Wimbledon and Murraymania is at fever pitch but, for once, Andy Murray is not the focus of attention. Today, Jamie Murray stands three sets away from his second grand slam title. Murray, together with John Peers from Australia, will attempt to prise three sets from Jean-Julien Rojer and Horia Tecau and complete a remarkable journey that began with a casual enquiry – “fancy playing some doubles?” – three years ago and, if everything goes in their favour, will end with one of the biggest prizes in the sport. No one is absolutely sure, but popular wisdom has it that the last Scot to reach a Wimbledon men’s doubles final was one Ian Collins in 1929 (Wimbledon draw sheets and records list homegrown competitors merely as British rather than Scottish or English). As for Scots in finals of any description, they were thin on the ground until the Murray boys came along and Jamie won the mixed doubles with Jelena Jankovic in 2007 and Andy won the singles in 2013. Back in 2007, everything was rosy for the elder Murray. He was a Wimbledon champion and he was climbing the rankings on the ATP Tour. But then his partnership with Eric Butorac split up, he struggled for a year partnering Max Mirnyi (they got on well enough but their game styles did not gel) and then he was left out in the cold. Unable to find a regular partner, his ranking dropped out of the world’s top 100 and he had to grind out a living on the Challenger circuit, one of the lowest rungs of the professional ladder. Then a chance meeting with Peers at the Australian Open in 2013 changes the fortunes of both men. “When me and John started playing together, I think probably that for me was probably going to be close to my last kind of effort to really try to get back there,” Murray said. “Because the previous two years, I played a lot of Challenger tournaments, some Tour events. But mainly played with loads of different people. Wasn’t much fun for me. Wasn’t really enjoying it. I think the opportunity came up to try to make something happen with John. Thankfully, it’s worked out and we’re here today. 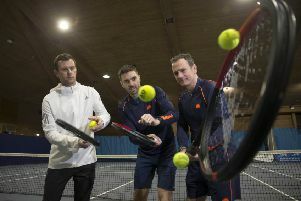 Although he no longer receives any financial support from the LTA – none of the doubles players do – he does have access to the brilliant doubles brain of Louis Cayer, the LTA’s specialist doubles coach, should both men happen to be in the same place at the same time. But with Murray being a part of Britain’s successful Davis Cup squad, he (and therefore Peers, too) have had preferential treatment from Cayer in the past couple of months. “I think that’s probably one of the biggest reasons why we’re where we are today,” Murray said. Cayer, a stickler for detail, will have worked out every strength and weakness of Murray’s opponents. But Murray, too, knows Rojer and Tecau. Rojer is one of Andy’s great friends and Tecau and Jamie have grown up together on the circuit. “We have played them a few times,” Murray said. “We met them in the first match of the year in Brisbane, then we lost in a close match in Rotterdam which they kind of stole a bit from us. We will fancy our chances but they will fancy their chances too. They have been playing really well this year, they have been very consistent in all of the events. It would be even better to beat them and, for Murray, to take centre stage in his own right. Andy has stolen the spotlight for many years but now Jamie has his chance to match little bro’s achievements. “I spent most of my life that way,” Jamie said without any hint of envy. “People come and talk to me because they want to talk about Andy, which is fair enough. That’s how it goes.